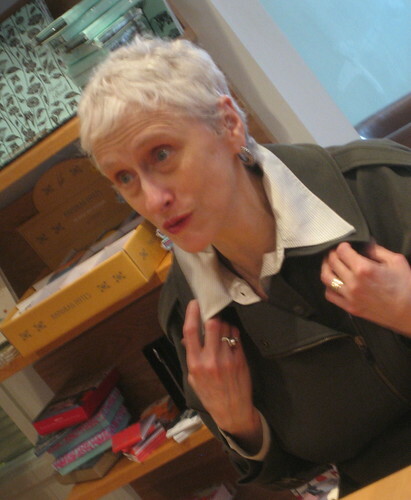 Pre-interview information had led me to believe that Sara Paretsky lives off cappuccinos, which would fit the image of the beautifully slim and extremely well dressed Chicago author. As Sara recounts a drinking story about Hammett and Faulkner, she says she can’t drink much herself, but can imagine herself in close contact with hot fudge sauce. She mentions something from her early, New York, childhood called the “good humour truck”, which I take to be a cousin of our ice cream vans. Sara Paretsky is pleased to be back in Val McDermid country, and claims that Mancunians make the best audience. Maybe they do, or maybe Sara thinks of something nice to say about everyone she meets. She’s amusing and confident, and for her talk in Manchester, the night before our interview, Sara is wearing what I call Katharine Hepburn trousers, a beautiful grey knitted top and a long pink scarf. She drinks a smoothie which she dilutes with water as she talks. 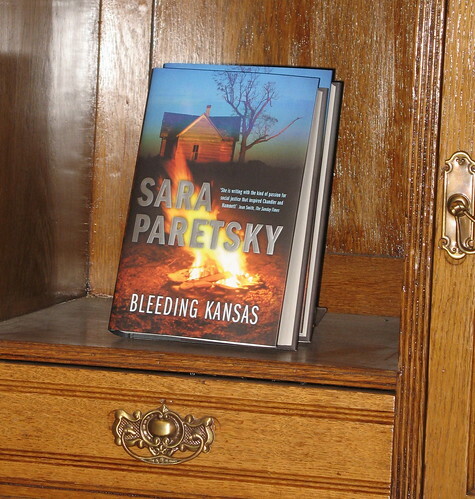 It’s the middle of Sara’s week long British tour to publicise her new novel, Bleeding Kansas. This is a departure from her V I Warshawski crime novels, but once you start looking, there are more similarities between the two than you’d expect. On Radio Five earlier in the week the book was introduced as crime, and it does actually fit that label better than you’d think. Though Sara calls it a “kind of thriller, not a crime novel”. The idea for Bleeding Kansas came after Sara heard about the women who bought her childhood home in rural Kansas, and the problems these two women, practising Wiccans, encountered with the local sheriff’s deputy, who “harassed them in a terrifying way, and began doing really frightening things”. The women had moved, hoping for privacy, but “you’re never private in the country”. Sara was busy writing Blacklist at the time, but couldn’t let the idea go. It took her a while to decide on the different plots. She had the Wiccans in her old home, and she added a story about the Jewish “perfect red heifer” that had been on her mind for some time. But it wasn’t until she was able to add the war in Iraq, that all the pieces came together. “It’s the story of, an autobiography of a place; the way people relate to each other”. Unlike the V I books Sara wrote this one in the third person, and whereas she would normally use quite terse language (albeit not as terse as Lee Child, she laughs), she didn’t with Bleeding Kansas. While reading Bleeding Kansas I’d felt that 14-year-old Lara was very much a young V I Warshawski or Sara Paretsky herself. I’m clearly not alone in thinking this, as many people coming up to talk to Sara during our interview say so, too. “Lara was my heroine in the book”. She couldn’t decide where Lara should be in the story. Should she be an adult, looking back on her childhood? After a some experimenting she settled on Lara as a teenager right now. Bleeding Kansas is a very political novel, in more ways than one. But so are the V I Warshawski novels, which is less expected in the world of hardboiled crime. In many ways Sara is critical of the politics of her country, but it seems that her new book has been well received. It wasn’t until our talk, that I realised that last year’s book Writing In An Age Of Silence, a collection of essays on politics, as well as on Sara’s personal background, was a British book. I had wondered how it went down in the US, but with this information I find it makes more sense. At home we had wondered where all the protesting Americans from the 1960s had gone, so I ask Sara if they are still around and still active. She says that yes, they are still there, but people are feeling isolated. She mentions a demonstration in Chicago with 100,000 protesters, that was never written about. There was a media blackout, and people thought they were alone. She reads the Guardian online, and reckons it “does a better job of covering the Pentagon than the New York Times or the Washington Post”. The difference with Vietnam was that “we knew Walter Cronkite would tell us the news”. It’s encouraging to find that Sara’s Manchester audience have wider interests than crime writing, and they want to know her thoughts on the war and on the presidential election. Sara says the American financial meltdown is due to the war, and she reckons Iraq won’t be any messier if they pack up and go home. Though she also waves her arms in the air and says “let’s not go into the war”. One of her readings from Bleeding Kansas is the very moving part where Lara and her family learn that her brother Chip, a new soldier, has died. We have got used to seeing imposing parades with flags and coffins in the news, whenever dead soldiers return, but the reality appears to be very different, and it’s really quite shocking and upsetting to read about Chip’s return in the book. Sara’s initial inspiration for this was hearing from a reporter friend who had to cover stories like these, and who said that the only comfort for the bereaved families was that they were at least supporters of the war. Sara turned this idea on its head, by making Chip’s mother Susan an anti-war campaigner, and leaving the family to worry about whether this had had the effect of sending Chip to war. Something else in Bleeding Kansas that concerned me was the extremes the members of one of the churches in the story would go to. There is a really scary part, where I kept thinking that surely some of these “upright” citizens would come to their senses and stop what they were doing, but they never did. I ask Sara if she had exaggerated this religious group, and she said she doesn’t “feel I exaggerated”, just “putting it in my own language, but not making up the content”. The Bible churches believe in the literal word of the Bible, and they are “very keen on war. God is not a pacifist”. “I worry that I’m not the kind who would have stood up to it … feeling I wouldn’t have had the guts”. In Kansas Sara has encountered many, kindly meant, attempts from Christians to “save” other people. When her own, Jewish, Mother was dying, the Mother’s very good friend wanted her to “find Jesus, so she wouldn’t go to hell when she died”. On one occasion Sara was walking along a street in Lawrence, desperate for a coffee, when she was accosted by teenagers, out “ saving souls”. Sara escaped, eventually, by only speaking French. The other mind blowingly weird religious story, is the scenario with the perfect red heifer, needed by Jewish fundamentalists to build a new temple in Jerusalem. You really couldn’t make it up. Sara came across the idea some years ago in the New Yorker Magazine, and loved the idea. 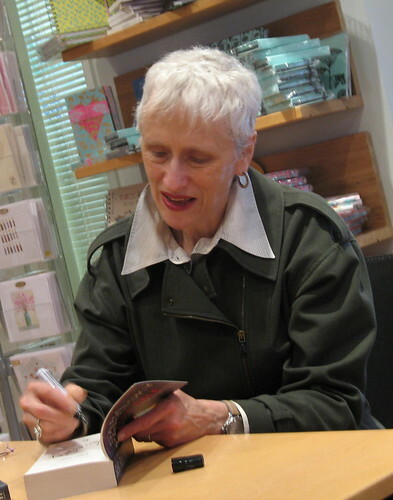 At least two more authors, including her friend Lee Child, have also written about the heifer. “It was the theme of the year. So grotesque”, she comments wryly. Sara knew she couldn’t use it with V I, so Bleeding Kansas was the perfect opportunity. She went back to Kansas for research, and spent some time on a dairy farm, learning about milking cows. Sara admits she was useless at it, and the farmer had to re-do everything after her. “I can’t believe anyone would willingly work so hard”, is her comment about dairy farming. The reason the Paretsky family ended up in rural Kansas in the 1950s, was that Sara’s Father, as the first Jew, was given tenure at the University of Kansas. Prejudice against outsiders in Lawrence was such that the Paretskys decided to move into an old house five miles outside Lawrence, with cows and wheat fields as neighbours. The Fremantle house in Bleeding Kansas is a replica of their house, hence the many important details, relevant to the plot of the book. Sara was the only girl in the family, and was expected to look after her three younger brothers, as well as help with household chores. Her older brother used to assist her with getting dressed when Sara was really small. She recalls how when she was four and he was six, he said he wouldn’t always be around to help her with this. Sara simply told him “Then I’ll find another boy to dress me”! “I feel sorry for my mother”, she says, “because we used to look after each other”. The University of Kansas feels an unlikely place for political demonstrations, but Sara says it was the most violent in the country in the late 1960s, with fire bombings on most days. Sara herself was in Chicago by then. I ask if she believes a Democratic President next year could undo all that has gone wrong in the last eight years, or if she feels the problems are too serious by now. Sara quotes The Cat In The Hat; “ This mess is so big, and so deep and so tall, we can not pick it up. There is no way at all.” Mentioning the official lies on contraception, and the opinion against books on evolution, she says that “just getting rid of that will automatically bring about a lot of change on the ground”. Sara doesn’t think that the incursion of Civil Liberties can go back. “He’s a very cautious boy, Barack. I don’t see him risking getting labelled as soft on terrorism. I do hope he will walk away from the war”. It’s destroying the community, and Sara feels that for the money they could have had decent public transport, better education and a better health service. “Things will be better, but it will not be fabulous”. It could take twenty years to change everything back. As a child Sara’s parents felt she thought too much, and wanted to warn her what would happen to girls like her, so they gave her Mark Twain’s Personal Recollections of Joan of Arc, which Sara describes as a “three hankie special”. Contrary to what her parents had hoped for, Sara “felt it was my destiny. I needed a big cause. It was my guide book for life”, and here she laughs uproariously. But she got distracted by beautiful clothes and things like cappuccino machines, she says. We speculate that maybe if Joan hadn’t died so young, she would have developed, too. Sara mentions a Leonard Cohen song about Joan of Arc. And she describes how she read Marina Warner’s book about Joan of Arc in the bath, and she just couldn’t stop reading. She kept having to refill the bath with hot water, and this is why she doesn’t believe in the modern reading machines. “Absolutely lethal”. Sisters in Crime is a group of women crime writers set up in 1986, which Sara has been heavily involved in. They found that if you’re a female writer, then your book is less likely to be reviewed, and if you don’t get reviewed, then libraries and shops won’t know about you. Sara didn’t want to be confrontational, but wanted to educate people, and so they went directly to librarians and bookshop. This was very effective, but only for as long as they monitored things. Now that paper is a much bigger cost in publishing books than it used to be, publishers save by having more original paperbacks. Women writers are more often published in original paperback, and as paperbacks get reviewed less, then women writers get less reviews. Sara is no longer active within the group, and she feels they concentrate more on being a social organisation and network, and that they no longer tackle serious issues. Speaking of reviews, Sara chuckles as she mentions a review in Time Out for her V I Warshawski book Tunnel Vision, where both she and V I were described as being ready for a “home for deranged feminists”. I compare this opinion to one in the Swedish magazine Vi with the review headline “Why V I is one of my best friends”. This is something I can easily identify with, because V I really does feel like a potential, very good, friend. V I may be a private investigator, but she’s first and foremost a friend and defender of those who are without power. The first three V I books Sara wrote while she was working full time. Then the film, starring Kathleen Turner, came along, and Sara was paid $50,000 up front for the film, which enabled her to write full time. Sara says “it’s not the kind of film I’d have liked”, but mentions that one nice thing about it was being allowed to run on the playing fields of her home team the Chicago Cubs, during the filming. She describes her team as a “useless bunch of losers”, which I take to mean she loves them, really. The advantage of having attended a very small school as a child, was that they all got to have a go at playing games. Sara says that she learnt to throw like a boy, but unfortunately often in the wrong direction. She even has a sports injury to prove her ball playing past. She broke her finger, which her Father insisted on setting, and it never quite recovered. While speaking about the film, she says that Disney, who own the rights, don’t pay any attention to her at all. Sara’s going to Hollywood in May to discuss another film. “I don’t like confrontation”, she says, but she’s hopeful that someone will have another crack at what she wants to see; “a really good detective movie”. Currently Sara is working on her next V I Warshawski novel, and she’s about 80 pages into the book. “That means another 420 to go”. She “worries constantly” and says that the fear of the blank page can “paralyse you more and more’. When asked, Sara says she’s not sure how to deal with V I’s age; she has to age, but not too much. But Sara is quite clear about the dogs, who will stay the same age forever. The new book will feature a young cousin of V I’s, as some sort of P I’s deputy. Sara has considered starting to write a new series, possibly based on a short story she once wrote, which she liked. She claims not to write very efficiently, but doesn’t think of her editor all the time. Writing is a “chance to lose myself in stories”. When she started writing she wanted to be as good as Shakespeare. “Now I know I’m not Shakespeare and I hate it!” But I have to say I like Sara Paretsky better than old Will, and as one of her fans says; Shakespeare only plagiarised, whereas Sara is original. Well said. 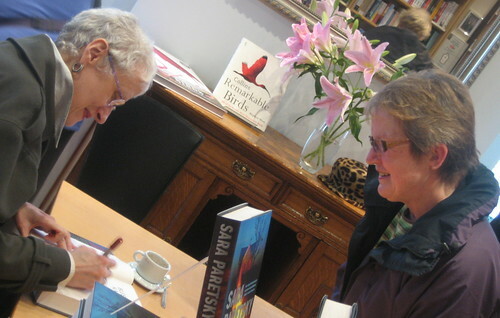 For such a popular and well known author, Sara is very good at the personal touch. 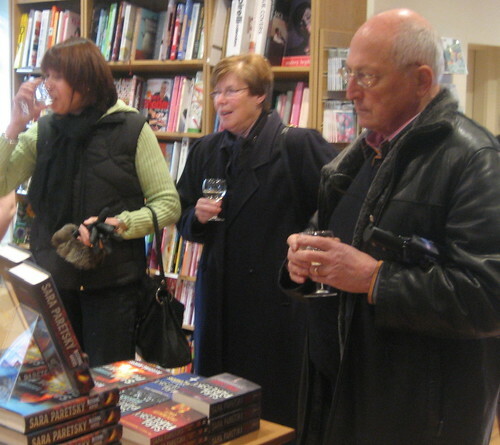 She answers emails, and she took a personal interest in coming to the local bookshop, where we meet for our talk. I’m glad I kept up a steady stream of emails to achieve this, when I see how pleased the customers in the shop are. “I can’t believe you’re here!” says one, and it’s easy to tell she’s in awe of finding her American bestselling author in her local bookshop. Sara makes out it’s through the skills of her driver, i.e. that they didn’t get lost en route, so maybe she doesn’t realise how special it is for fans to come face to face with her. Unexpectedly, too, for one man, who just happened to turn up for his Saturday coffee, only to find his favourite author was there, too. Sara sits at the book signing table, with her cup of Macchiato, giving an impromptu talk to the enchanted customers. She’s good at remembering people’s names, too, half an hour later, and she’s the perfect hostess, getting up to hand her fans glasses of wine. She offers to relieve one customer of £20, when he asks who he should pay. And she laughs a lot. The day we meet would have been her Mother’s 87th birthday, if she’d lived. As for herself, she says “turning fifty, it was a hard birthday for me. I’m so opposed to getting old”. Well, Sara is not old yet. And I find it hard to understand how someone who’s so beautifully slim, was once fat (her own words). She refers to a car crash she was in some time ago, and the physiotherapy afterwards. Sara says that before she leaves she may just lie off the edge of the book signing table for a while. Though, they’re in a bit of a hurry, so she grabs her very elegant hat, and mournfully avoids getting stuck by the greeting cards, or she’d never get away. “All’s right with the world”, she says, and leaves. She’s off to Barnsley, Cambridge and Paris, and then back for a holiday in Devon. But she misses her Golden Retriever. That is a really fascinating interview, Bookwitch and you ask all the right questions…the things her readers want to know about! But when I saw her in the 80s in the big bookshop in town, she was ALSO slim. I think US women have different standards, perhaps, of what consititutes FAT! The photos added so much, and you’re looking pretty good yourself. Thanks! Really enjoyed this. Though The Cat In the Hat quote might lose me sleep. But Adele is taunting us. It’s obvious who Sara is, but which is the witch? I know; Dr Seuss can be so worrying. It IS obvious to Adele. But I think if you discount the possibility that I’m a wooden cupboard, it won’t be hard… I’m not my next door neighbours’ best friends, if that helps? I did consider publishing only the picture where you have Sara, and I’m barely visible behind the lilies, but opted for complete bravery. So, not a wooden cupboard, not a vase of lilies… aha. But of course you are a Remarkable Bird. Oh, you witty people north of the border! I love Sara Paretsky and V.I. Warshawski, my favorite woman detective. 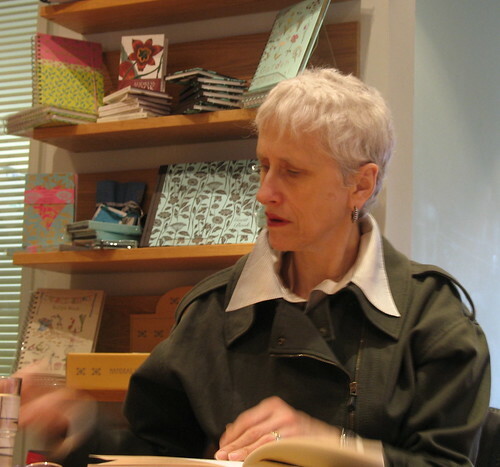 Paretsky’sstories are good, her politics good. I hope she can write for years to come. The political issues that she raises in the U.S. are important–the wars, racism, political brutality, sexism, homophobia, encroachment on civil liberties, mistreatment of immigrants, sweatshops, and more. More authors should be doing this. And she speaks out on these issues, doesn’t just put them in her fiction. errata: line 2 should be “police brutality” Not much political brutality around here except for the Tea Party and associates.